In the slot there are three drums, and ten active line designed to compose winning chains on them. 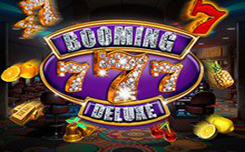 On the screen of booming 777 deluxe appear lemons, oranges, cherries, pineapples and bells. These pictures operate according to the usual principles and can appear with long vertical bands, which allows them to occupy entire columns. Wild himself brings payments and replaces other items, except for the scatterers. It also launches the 2-Way Pay function. Scatter (red sevens) with the appearance of at least three such symbols, activated free spins. Multiplier drops out only on the second drum and acts as a wild, replacing the missing simple pictures in the chains. 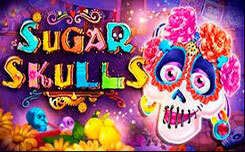 Free spins – is given the right to run the drums ten times for free. The bet and the number of lines remain unchanged until the end. 2-way pay – Three wild, start the mode of forming combinations on both sides. It lasts for ten spins.